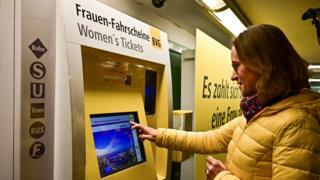 Berlin’s public transport authority BVG is offering women a 21% discount on fares in the capital to mark Germany’s Equal Pay Day. BVG says the aim is to draw attention to the average 21% pay gap between men and women in Germany – one of the biggest gender pay gaps in the EU. According to EU data for 2016, the gap is greatest in Estonia (25.6%) and smallest in Romania (just over 5%). The UK gap is about 21%. The gap is 16% on average in the EU. Explaining the women’s “Frauenticket” scheme, only valid for Monday, BVG said the 21% gap was equivalent to 77 days of unpaid work for women. And 18 March – Equal Pay Day – is day 77 since the start of the year. A normal €7 (£6; $8) BVG day ticket has been reduced to €5.50 for women. BVG says it provides equal pay for women and men in all its job categories and is seeking to make women 27% of its workforce, from the current 20%. a male lawyer gets €5,700, while a female lawyer gets €4,953. The EU compares average pay across the 28-nation bloc by looking at gross hourly earnings for men and women in enterprises with 10 or more employees, in both the public and private sector. The gender pay gap in finance and insurance is higher than in the business economy as a whole, the EU’s statistics agency Eurostat reports. In general, the male-female pay gap tends to be much lower for younger employees – it widens with age. In most EU countries the gaps are wider in the private sector than in the public sector.